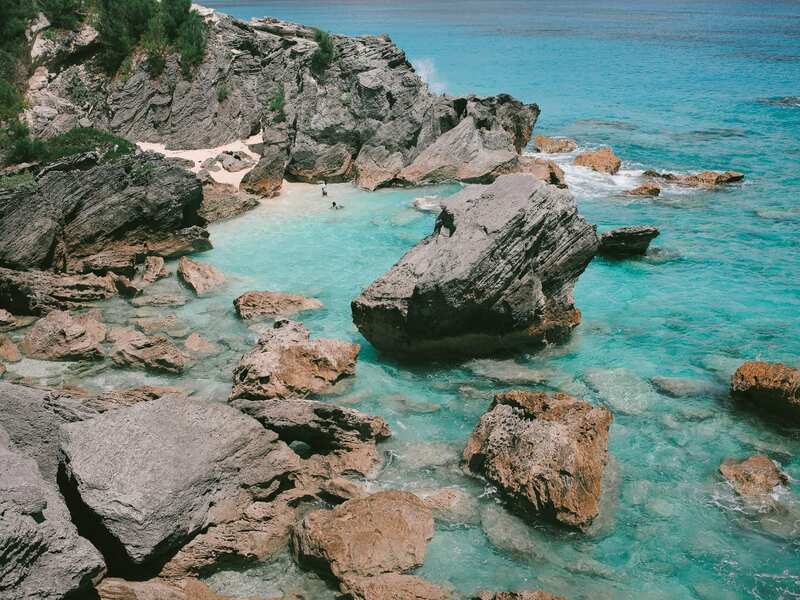 Oh my gosh, Bermuda in summertime is almost too much to handle. The ocean is SO crystal clear and vivid, it’s like you’re constantly looking through a filter. It is quite shocking and so mesmerizing, and also my favorite thing in the world so I felt like I was walking (and swimming) in a dream. We stayed with Hamilton Princess, who very kindly invited us for this three night trip. The hotel sits in the heart of Bermuda’s city, Hamilton, and is both enormous with everything you might need and also a totally peaceful oasis. We ate at the hotel all three nights (despite awesome off-site recommendations, which we can’t wait to try next visit…soon…. ), and it was such an easy place to hang out as a family. It is very well set up for children, with large rooms, lots of activities, a child-friendly staff, and toys around every corner, from the pool to the beach club. We spent a fair amount of time at the beach club, ate lunch there, swam, had a cocktail, etc. There is a pirate ship play garden with a slide and a digging tractor (we’re very enthusiastic about trucks right now) which kept us all entertained. We did, however, wish to find some more deserted beaches and were lucky to connect with a very helpful taxi driver who ended up as our personal tour guide for the entire trip. He was extremely helpful and I would love to share his information with anybody visiting! The hotel offers tours, and this felt like ‘insider scoop’. For example, we visited a completely deserted, wild beach while our little one napped in the stroller in the shade of a palm tree (yes, seriously, that happened), Will and I took a dip in the cleanest, clearest, softest water…it was exceptional. And of course when our little one woke up, we couldn’t wait to bring him in…. For two of the evenings, we ate at Restaurant 1609 on site which has views of the harbor and is very child-friendly. The first night we walked straight off the beach into the restaurant, something we rarely do because we typically shower and change for dinner but we were wiped from the wedding weekend and early morning travel, and ate very early, admiring the sunset with a bottle of rosé. The second night we spent sunset in historic St. George’s and then went back to the hotel for dinner. We were planning to eat at the Village Pantry in Flatts but ended up opting for the ‘easier’ option, closer to home, although it does look so sweet there! The last night, we ate at the acclaimed Marcus restaurant, also on site, with some pieces by Andy Warhol. It is southern-style fare with lots of fresh fish options and was a wonderful way to spend our last night in Bermuda. We had a half day yesterday and spent the morning in the gold lounge having a leisurely breakfast, followed by a dip in the pool before showering and packing up for home! This is such a beautiful place!